City officials in Portland are working with Gov. Gretchen Whitmer's office to secure state funding as the city recovers from flooding. PORTLAND, Mich. — City officials in Portland are working with Gov. Gretchen Whitmer's office to secure state funding as the city recovers from flooding. 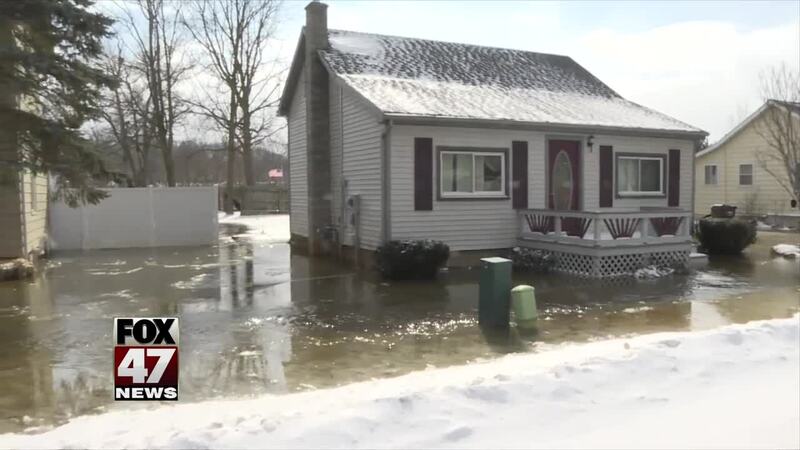 Ionia County officials already declared a local state of emergency after residents had to be evacuated last Wednesday morning when ice jams caused severe flooding. Portland City Manager S. Tutt Gorman says the city has been working with Gov. Whitmer's office to secure a disaster declaration for several days. After being closed since last Wednesday, the Grand River Avenue bridge reopened Saturday. In a Facebook post Sunday morning, Gorman said the city is continuing to monitor and assess the Bridge Street and River Trail bridges that were closed due to the flooding. The Michigan State Police Aviation Unit surveyed the damage over Portland Saturday. Gorman said the flight revealed a number of things. The main ice jam is located about ¼ mile downstream of the waste water treatment plant, and there is about one mile of jumbled ice behind that jam causing the flooding. There is strong ice further downstream before the city dam, but it isn't causing blockages. There is a second ice jam about ¼ mile upstream of the main jam. That ice jam is backing up another ¼ mile of ice. If that ice breaks free, it will move downstream and reinforce the main jam, likely causing more shifts in water levels. There is a third ice jam one riverbend upstream of the Charlotte Highway Bridge. More than 3 miles of ice chunks are backed up behind that jam. There is a substantial amount of loose chunk ice on the Looking Glass River that is waiting to dump out into the Grand River once it gets unplugged. Gorman says the city is continuing to work closely with emergency management officials, MSP, the Department of Homeland Security, and the U.S. Army Corp of Engineers.